Having performed these steps, your tender should be set to confirmed status and you are ready to compare the prices quoted, and decide upon a preferred supplier for each item. Before analysing the various responses to your tender, you may wish to set one of the suppliers to be a benchmark (or maybe you had specifically added a dummy benchmark supplier to the tender and added benchmark prices in their quote). If you so this, mSupply will indicate how much higher or lower than the benchmark supplier's quote, all the other suppliers' quotes are. It can be a handy indicator to help the analysis process. For more details on using benchmark price see Using benchmark prices. Note that mSupply will remember any changes you make to the widths of the columns on this tab. This can be very useful if you want to minimise columns you are not interested in to make room for other, more important columns over several sessions to select the winning bids. In our example, 5 suppliers have been invited to tender, and 4 have submitted tenders, one supplier having submitted prices for two different pack sizes. One supplier has not submitted a quotation, so all the entries for that supplier are zero. The important column is the Adj Cost column, this allows you to compare prices which have been evened out to cater for differences in pack sizes, currencies and freight costs. mSupply makes it easy to identify the lowest price quoted because it appears in blue type. Clicking the Adj Cost column header will sort the entries so that the cheapest one appears at the top of the list. If a benchmark supplier had been selected then the +/-% column would display what percentage above or below the benchmark supplier's quote that particular quote was. A negative value indicates that the quote is below the benchmark quote, a positive value that it is above. e.g. a figure of -2.78% would mean that the quote was 2.78% less than the benchmark quote. If you want to highlight any particular line for any reason, you can change its colour by clicking on it in the list to select it then selecting the desired colour from the colour drop down list (currently showing “Black” in the screenshot) in the top right hand corner. Note that if you want historical data of all previous stored quotes for an item, including those from previous tenders, this is available by choosing Items > Show items… from the menus, locating the item, then viewing the Quotes tab. Has the supplier met all the tender conditions? Is the proposed delivery schedule acceptable? Is the product being supplied by a reputable manufacturer? The Disqualified column allows you to disqualify the quotation from a particular supplier if required by checking the box in the relevant row. If you want to see more information about a particular quote line, double-click its row to open the Edit quote line window to view all the details of the quotation (and edit it too - useful if you discover a data entry error, for example). You may want to fill out the Quote Comment to record any decisions you made e.g. reason for disqualification. When you have decided on a supplier for an item, check the box in the Preferred column in the row for that supplier. Proceed to the next item by clicking the OK & next button and repeat the process. When you have finished, click the OK button to return to the Edit Tender window. It is, of course, not necessary to complete the selection of preferred suppliers at one session on the computer; it can be done in stages. Actually, you don't have to select preferred suppliers for all items before you complete the tender; you may want to wait for more favourable market conditions before purchasing some items, for example. Please also note that all changes to tender lines are logged by mSupply. Two of the lines have been changed to a green colour and the Show drop down list just above the list of items has been changed to “Not chosen” so that it displays all the items for which a preferred supplier needs ot be chosen - helpful for seeing what still has to be done! If the Show drop down list is changed back to “All”, all items will be displayed in the list, with the name of the Preferred supplier column for each line shown in the Preferred Supplier column. Once you have finished editing, click OK (or Cancel if you want to close the window without saving changes to the current tender line). The column Preferred Supplier will now display either the name of the supplier you have chosen or Not chosen where you have not yet processed the item. 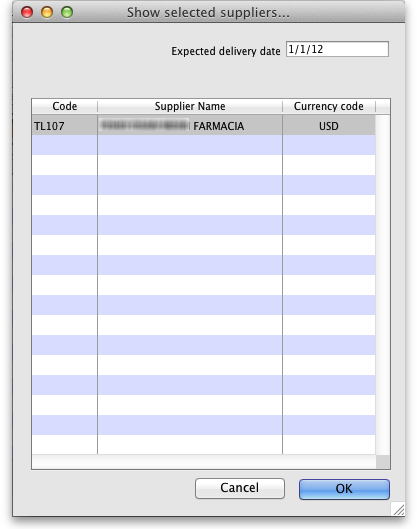 The Original column will display the cost of that line if you purchase the tender quantity of that item from the preferred supplier in the currency quoted (The Original Local column displays the cost in the local (default or home)currency you are using in mSupply). Note that you might end up editing the quantity on the purchase order to a different value, and then the PO local column will have a different value. Just before you create purchase orders for the winning suppliers you might like to see the value that each supplier has won. To do this, click on the Choose Suppliers and Enter responses tab and the total value that each supplier has won (i.e. the total value of all the lines where they were selected as the preferred supplier) will be shown in the Tender value column. The total amount that each supplier bid will be displayed in the Total bid column. Supplier quotes for each item: Shows quotes from all suppliers for all items, grouped by item. Handy for a summary of all received quotes. Tender lines with predicted cost: Can be used to give an approximate cost of the tender before choosing preferred suppliers for all items has been completed. Where items have not been allocated a preferred supplier, mSupply will use previous purchase costs as an estimate of what the cost will be in this tender. Tender lines: lowest price not chosen: Shows all tender lines which have been chosen as the winning bod when their price was not the lowest. Summary detail shows how much more you will pay than choosing the cheapest lines. Once the choice of preferred supplier has been made for all the items you want to purchase in the tender, the next stage is to generate the Purchase Orders. Recalculate PO quantity according to usage should be chosen if you wish mSupply to take into account the usage during the period since the tender was generated; this may be significant depending on the length of that period of time. Distribute Tender quantity evenly should be chosen if you wish to make no changes to the quantities calculated at the time the tender was generated. For our example, we are choosing Distribute Tender Quantity evenly because we are content with the quantities which mSupply has calculated and we do not want to make any adjustments. In this case, the Based on field should be ignored. If you want to receive split deliveries, then mSupply will create multiple purchase orders for you, each with a different requested delivery date. mSupply will behave differently when creating Purchase Orders depending on whether this option is checked or not. Note that the creation of purchase orders from tenders will be logged by mSupply. If you have checked the “Split deliveries” checkbox in the preferences for this tender, the first button on the toolbar will be Create blank POs. Click on the supplier(s) you want to add, and enter the requested delivery date, then click OK.
You will need to add each supplier twice if there are to be 2 deliveries, or 3 times for 3 deliveries (etc) Make sure you get the delivery date right for each one. You can double-click an already entered line to change the delivery date. Use the Delete PO button to remove a purchase order (highlight to one(s) to delete before clicking the button). Click this button, and the needed Purchase orders will be created. Double-click a row to see the order. Return to the “Suppliers” tab if you want to see the value of the purchase orders in total. Go to the Purchase Order tab. You will see your purchase orders for that item. To edit the first row, click once on the quantity, wait 2 seconds and click again. You can now change the quantity. Use the tab key to advance to edit the quantity of the second row, etc. be available using Suppliers > Show Purchase orders from the mSupply menu or navigator. Repeat the process with other purchase orders that are ready to send to a supplier. You can now view the purchase order, confirm it, and send to a supplier - see Purchasing: Ordering from Suppliers: Viewing a purchase order. This should be done when all processing of the tender is complete and the purchase orders have been created and sent to the suppliers. The tender will not be editable after this so PLEASE make sure you are sure that all processing is complete! When you finalise a tender you will be warned if there are no Purchase orders associated with it because you won't be able to create them later!